George Herman was an American baseball player who played for The Boston Red Sox and New York Yankees. On his passport, his height was listed as being 6ft 1.5. This is about right I think. In photos Ruth often looks shorter than people this tall or shorter (e.g., Gehrig, who was a strong six footer). But I put this down to his very relaxed posture, in particular when he was older and his weight had really ballooned. Rob, you should do a page for DiMaggio as well. Like Ruth in the 20s and early 30s, biggest celebrity in the country, arguably, in the late 30s and 40s, and a good one for this site as his height is genuinely "controversial" (listed 6-2, couldn't have been that, I'd say, when you see pictures of him next to someone like Ted Williams, who at almost 6-4 towers over him). Rob do you do other baseball players? Editor Rob: not really got many on here. There are a ton of photos with Babe Ruth and Jack Dempsey, the two biggest names in American sport during the 1920s. Jack Dempsey was 6 ft 1/2". In every standing photo with Ruth, Jack Dempsey, the Manassa Mauler, is the taller of the two. I would say Babe Ruth was 6 ft tops. I'll tell you the truth, Rampage, I don't really know that much about baseball, but it is my understanding that the balls and bats have remained unchanged for over ninety years. Maybe the pitching mounds have been raised or lowered. The ballparks have always been of various sizes, so it is easier to hit a home run in some parks than others, but the game's particulars have been kept fairly constant. I can't see how pitching could have changed that much, since the act of throwing a baseball is basic and simple, and there can't be much that can be done to make the ball go faster or curve more sharply. Ruth was just God's own baseball player. I doubt if he worked at it, or even thought about it all that much. He just had the talent. I a bit surprised he was small as a child but heavy. Then he sprouted to 6 1 or a rapper 6 3. 6 6 seems crazy what little evidence is out there suggest 6 foot to 6 2. There were taller folks than him when he was you before he got fat. He was one of the best all time no question modern drug athletes don't compare. @Ian C: Far from it...the science behind sport has evolved dramatically and his records have been pulverised many times over. I doubt he'd be a pro if he was in this era. @Ian C: Far from it...the science behind sport has evolved dramatically and his records have been pulverised any times over. I doubt he'd be a pro if he was in this era. Is it not odd that one of the most athletic Americans of the twentieth century was overweight? 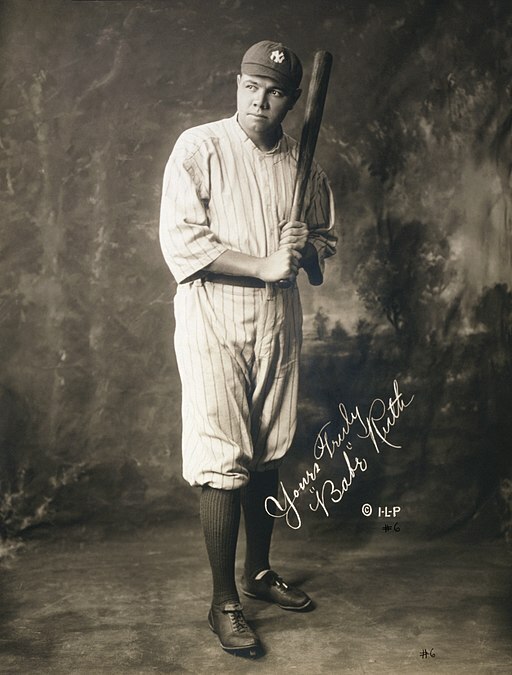 I have read that, if a magically cloned Babe Ruth were to play professional baseball today, he would still be the best batsman in the game. Other classic ballplayers like Honus Wagner and Lou Gehrig looked like supermen, but the Babe just looked like your Uncle Dave in pajamas and knee socks and a baseball cap. Why aren't there more MLB players on here? Rob, is it because you're from Scotland, and so most baseball players just aren't on your radar? I doubt it. He'd like to trade places with Festah, Sheldon or Blinky, the RCA Building autograph crew of the 80's. 6' 6". Hate it. Ruth had a powerful swing much like Reggie Jackson. Brad, assuming it's the same one as Bieber page, is 6 ft 6 I think, and he's not one of the fake "I'm 6 ft 6" type posters either. He really is. I thought he was supposed to be 6'5". Yeah, played by John Goodman so gives the idea that he was a mountain of a man, but a bit of an underwhelming biopic. Never thought I'd see a baseball player on here. What made you decide to add him, Rob? My father met him many times outside the stadium, both were same height, 6' 1". I'm basing this off of the fact that Jay Z is Alex Rodriguez's height. He's 186-187 CM in my opinion. Would you please do a page for Alex Rodriguez? I think that he's more 186-187 CM than 190-191 CM. He was listed at 6'2" a lot, I reckon 6'1.5" looks right for Ruth. Pretty tall for his generation. For some reason I always thought he was small. I think that's an accurate one, thanks for adding. In The Pride of the Yankees, he looks a solid couples inches under Gary Cooper but was a bit older. The real Lou Gehrig was listed as 6'0" but only seemed to be a tad shorter than Ruth. I'm guessing Gehrig was actually more like 6'0.5"-6'0.75" range. i have always believed he was 6'1" and i still think now. He was listed 6'1" in the most of the sites i remember.